I need assistance on how to setup the general settings in winbox wireless, data rates etc. Hi @Ragnar10. Your Omni will need an IP and a 'WUG' Route so that it knows how to reach the CTWUG Network, so via your Terminal you can run this script. 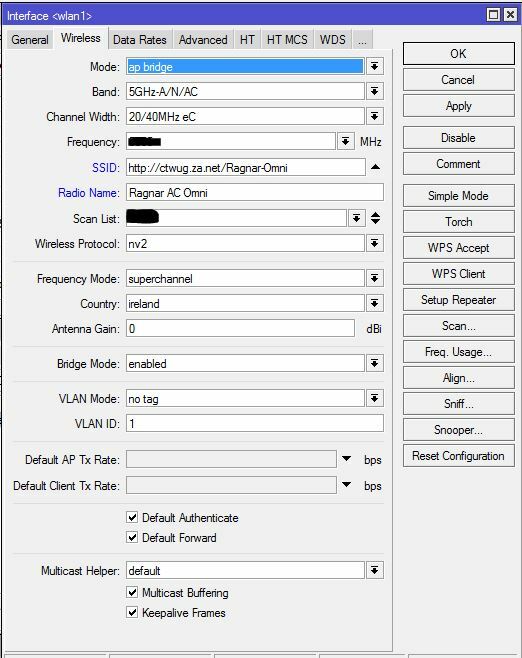 /ip route add dst-address=172.16.0.0/12 gateway=CoreRBip comment="Route to CTWUG"
Below is an example of the Wireless Settings. Frequency depends on what is available at your site. You might also want to consider switching the Channel Width to 20mhz only. Below is an example of your Data Rates settings. If you are combining single polarity with Dual Polarity clients you will need to tick some of those rates on, which ones is difficult to say, you will need to find the sweet spot that works well with your set of clients and mixed hardware. 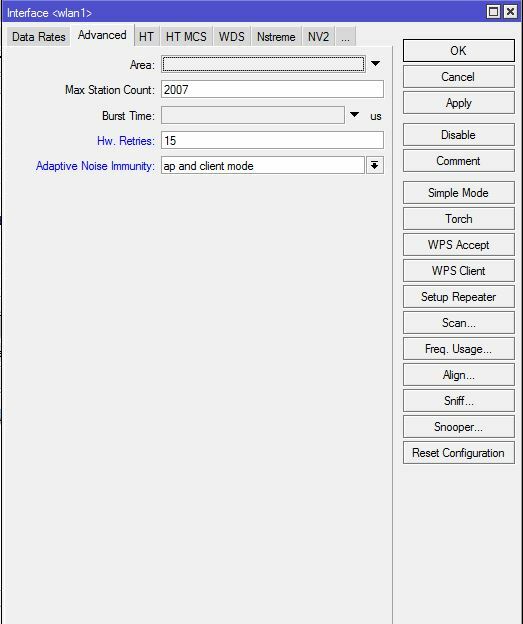 Below is an example of your Advanced Wireless settings. 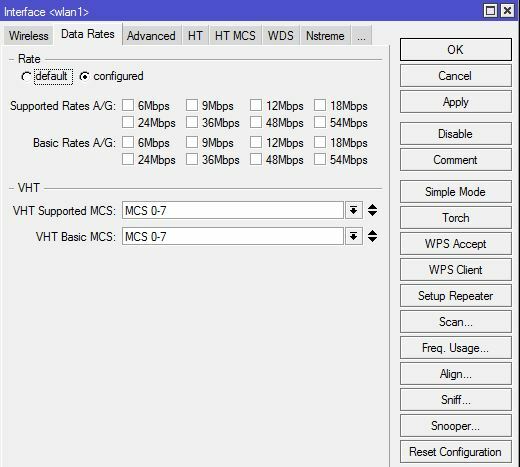 Below is an example of your HT MCS settings (basically sync rates), some guys don't adjust this and let it choose by itself but I configure manually. Higher sync doesn't always mean faster, I prefer the quality over quantity route. 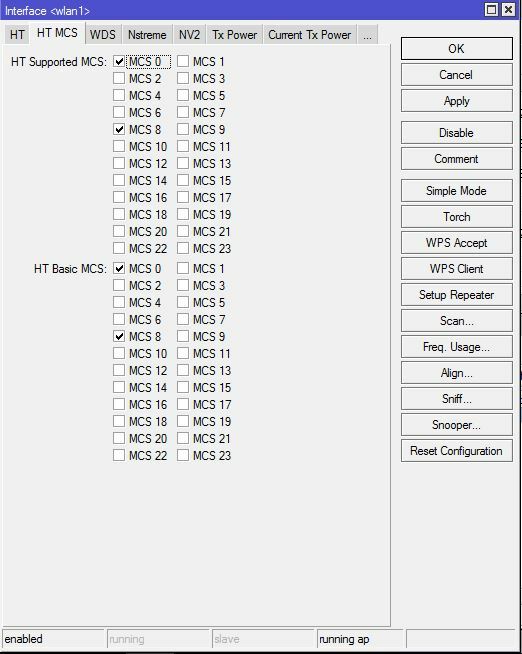 MCS 0-7 is for single polarity clients, MCS 8 and above is for Dual Polarity clients, so if you are mixing the two then you will need to tick for example MCS 4 and MCS 8, get a base line for how stable your client connections are and possibly work your way up from there. a 60 or 90 sync for clients is great if the CCQ's are good. Sometimes you also need to tick two together, the wind might blow a bit hard so for example if you have MCS9 ticked then it is a good idea to have MCS8 ticked along with it. If you need a device to log into to compare settings you can log into 172.18.14.13, username ctwug and password ctwug. This is a read only account. The device is also an AC Omni. Thank you for your response very informative and detailed.